Southland’s Nick Kergozou had a hard-earned medal slip from his grasp on the penultimate night of finals at the UCI Juniors Track World Championships in Korea. Kergozou fought back from sixth overnight to third place in the gruelling six-event omnium going into the final event at the Gwang Myeong Speedrome. However he could not latch on to a select group that put a lap on the field during the final points race, with with the 20 bonus points, three riders edged over the Kiwi in the overall standings, finishing sixth. Kergozou started the day in outstanding fashion by winning the 1000m time trial in 1:03.801s which jumped him from sixth to third placing. He finished second in the 250m flying lap in 17.872s, jsut 5/100ths of a second behind Denmark’s Casper Pedersen. It strengthened his third placing behind Pederson and Australia’s Sam Wellsford. But he could only manage sixth in the points race to finish on 166 points, only nine points off the bronze medal position. Waimate’s Holly Edmondston is in eighth place after the first three events in the women’s omnium. She was seventh in the 7.5km scratch race, fourth in the 2000m individual pursuit in 2:29.413 and ninth in the elimination race. Edmondston competes in the 500m time trial, flying lap and points race on the final day. Earlier Taupo’s Lewis Eccles bowed out in the first round of the men’s sprint. Eccles qualified 18th in 10.653s but was beaten by Marco Bravo (ECU) in the first round. Teammate Jordan Castle (Palmerston North) was timed at 10.771 in qualifying but did not advance to the elimination rounds. Auckland’s Nina Wollaston finished eighth in the women’s 20km points race, claiming two second placings mid race. 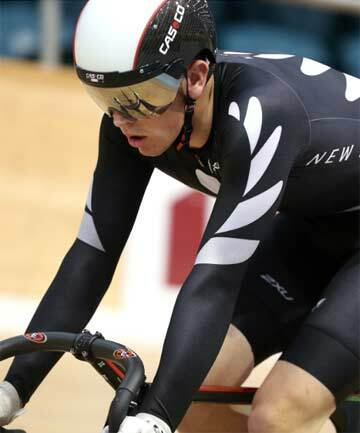 New Zealanders will contest the women’s keirin, women’s omnium and men’s Madison on the final day tomorrow. Men Omnium (results for Nick Kergozou): Scratch race 8; individual pursuit 3:27.997, 6; Elimination 8; 1000m time trial: 1:03.801, 1; Flying Lap 17.872, 2; Points 6. Overall: Casper Pedersen (DEN) 200 points, 1; Sam Wellsford (AUS) 181, 2; Jihun Kim (KZOR) 175, 3. Also: Nick Kergosou 166, 6. Women Points Race: Camila Valbuena (COL) 49 points, 1; Yumi Kajihara (JPN) 41, 2; Josie Talbot (AUS) 22, 3. Also: Nina Wollaston (NZL) 7, 8.